This essay was originally published in the exhibition catalogue of SOUND: Latitudes and Attitudes, held at the Institute of Contemporary Arts Singapore from 7 February – 16 March 2014. Minor revisions have been integrated for its publication in eContact! 16.2. The soul is lonely and weary of its existence. To reaffirm its existence in a silent landscape, sounds are made but not necessarily music. If we observe the wolf that wails in the middle of the night, it simply wants to express its existence. A reaffirming sound is made, while everybody else is provoked. When you hear something provocative, it is not necessarily noise. Let us put aside the sometimes convenient but all too clichéd argument that “you may close your eyes, but not your ears.” That the analogy is also all too literal is not new, for sound is not only registered through our ears but also through our bodies and our brain. Listening is more than merely physical. That is to say, sensorial matter can mediate and animate new relationships between a subject and its environment, connecting a constellation of spaces, bodies and objects, should we choose to listen. Stirred from insularity, the self thus becomes interwoven with the world, aware of an increasing participation with things beyond oneself, one that unfolds in time and space. It is listening, as Heidegger underlines, that the human being (Dasein) engages with and participates in the world and is made meaningful through connection, defined by its very awareness and openness to itself and its relationship to other entities. Listening is, then, a form of participation too, a giving of attention to the people and world around us — a form of care. It requires effort, an active process that suggests openness to others. For instance, if I am listening to someone speak within a framework of sociality, receiving and engaging in conversation while rejecting others, then to be heard is to cross boundaries, to be acknowledged, to be given attention to. Yet despite being contemporaneous with the sounds that permeate our body, listening remains full of uncertainty. Between what I hear and the sonic phenomenon or object, I will never comprehend its truth, but can only grasp at its fleetingness, generating an understanding for myself — the meaning of what I hear is always still yet to arrive. Therein lies a contradiction: sound demands our complicity but persistently obstructs understanding. How do we make sense of or find meaning in an expressive medium that, unlike the visual tangibility and “stability” of images, insists on the disparity between what is being heard and what is understood? More often than not, we pick and choose what we listen to — words spoken to us, music, environmental sounds — looking for familiar signals or signs and then quickly affixing mental images to them in an attempt to be able to familiarize ourselves with them, gain mastery over them, categorize and simplify them, or give them names. But sound resists such simplistic signifiers. It challenges and expands our thoughts without necessarily generating a reality of lived experience, allowing for imagination to probe at meaning. Rather than muting or neutralizing these resonances, perhaps listening demands being susceptible to sound’s uncertainties. That is, meaning is perhaps not situated in the ability to equate what is listened to with reasoning or comprehension — connecting perceptible registers and the intelligible register — but it is rather found within the straining towards possible meaning itself. Rather than casting aside that which cannot be easily grasped, it is perhaps within this tension that we may engage a resonant meaning. After all, listening is not simply about engaging with the familiar. Any attempt to write about sound — as I do now — is an exercise in this very contradiction. Ultimately, the search for meaning within sound must remain first and foremost a strategy of critical and intuitive listening, of experience, rather than of reasoning or of discourse. The considerations of listening — of subject, an economy of relating, attention, communication and meaning — that inextricably contour the sonic arts, and how to facilitate a space in which audiences may experience and encounter various forms of sound in a non-linear manner, was central to the conceptualization and development of the first edition of SOUND. Developed together with Bani Haykal, SOUND aims to be a series of exhibitions and programmes that will provide a platform in which to engage with sonic arts, with each edition focusing on specific approaches to sound or aspects of sonic activity. The first edition, SOUND: Latitudes and Attitudes (7 February – 16 March 2014), explores a vast array of sonic expressions by various practitioners in Singapore whose practices share the use of sound as a medium or subject. Featuring works by visual artists, musicians, composers, performance and media artists, the exhibition engages with a wide scope of sonic works that invite various possibilities of listening. The exhibition consists of five components in and outside of the gallery space including sixteen curated listening stations, a series of four changing installations, eight sound performances, a selection of sound scores and an archive. The works featured as part of the listening stations, or audio points, are representative of this broad spectrum of sonic sensibilities, from stillness to noise, random to structured forms, and personal to collective interactions with sound. They invite listeners to experience sound on a more intimate level. This spectrum of sounds is experienced not only across the listening stations but also within the selection of compositions that continually shift, washing in and out of the private realm of the ears. It encourages a concentrated listening, introducing alternative instrumentation, electronic possibilities, silences, found sounds and noise into the experience. It spans a field that is divergent in how it challenges or extends sonic paradigms, and included artists who were often conceptually and creatively contrasting. From the works of Joyce Koh to Gulayu Arkestra, Shaun Sankaran’s Mindfuckingboy work to Darren Ng, The Observatory to Zul Mahmod, and more, the selection of works for the listening stations also makes manifest the complex entanglements between experimental music and sound art. The works of these artists are placed in relation to one another not to resolve a gap but to facilitate connections that draw such tensions out. Developments in sound installation have allowed for sound to be seen further as a medium of art. Bridging sound and the visual (or giving sound an object, so to speak), sound installations move away from the durational towards the spatial conditions around it. They pursue a heightened perception of spatial relations and provide for a temporal experience that is separate from that of the concert experience. Space is intensely bound up with how and in what ways we experience sound, and this is explored in varying degrees through a series of interchanging sound installations by Mohamad Riduan, Zul Mahmod, Ong Kian-Peng and Darren Ng. Coinciding with each changeover of installations within the exhibition space are a series of sound performances by Mohamad Riduan, Zai Tang, Shaun Sankaran, Kai Lam, Brian O’Reilly, George Chua, Gulayu Arkestra and Dennis Tan in collaboration with Delphine Mei. The performativity of sonic material probes sound as a specific medium in its articulation, expansion or escape from conventional musical parameters, moving away from sound as object to integrate with environmental noise, social and acoustical dynamics, to meet the viewers in their mind, to be completed in the mind. Some of these performances particularly explore sound as a social, interactive medium that activates various relational exchanges between the work and audiences, between individuals within a crowd, seeking to inspire a form of sociality. The exhibition also features a selection of visual scores rendered in various formats. Music scores have been used as both guides to performing a piece of music and for studying and archiving musical compositions. Where some forms and uses of modern musical notation may prove to be rigid and authoritative, not to mention that comprehending them also requires a certain degree of literacy in contemporary approaches to notation, a number of composers and artists have turned to alternative means of expressing sonic ideas and the relationship between sounds. This includes modifications to conventional stave notations as well as the use of graphs, drawings, paintings and various forms of graphic notation. They often rely on forms of abstraction or basic indications of sonic arrangements that allow for more open interpretations, offering various entry points into performing and understanding a work. The works brought together in this section provide insight into the artists’ process of working with sound and their visualization of the relationship between sounds. Enriching the exhibition is Finding Sound, an archive developed by artist Mark Wong, conceived as a temporary space for uncovering and analysing the complex yet often overlooked history of sonic arts in Singapore. For Wong, it is an attempt to “[look] at the ways that a nascent sonic culture has formed out of the strands of experimental music, academic music, noise and underground music, theatre, and performance art” (Wong 2013). It comprises a series of new video interviews, photographs, event collaterals, video recordings of past events and audio releases, with annotations by Wong. Included in the archive are documentations and collaterals of events particularly during the late 1980s and early 1990s, which saw a shared spirit of enquiry and experimentation, often through the work of collectives and collaborations. 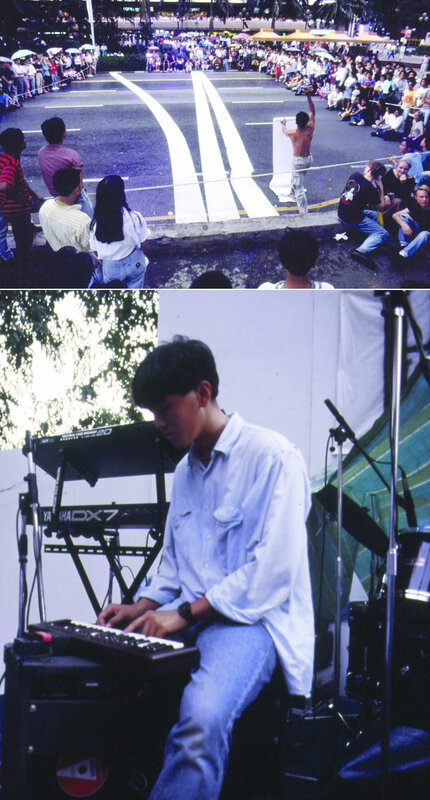 Such instances include the collaboration between experimental musician Joe Ng and artist Tang Da Wu for the performance To Make Friends is All We Want during the Singapore Music Festival in 1989, which took place along Orchard Road (Fig. 1). 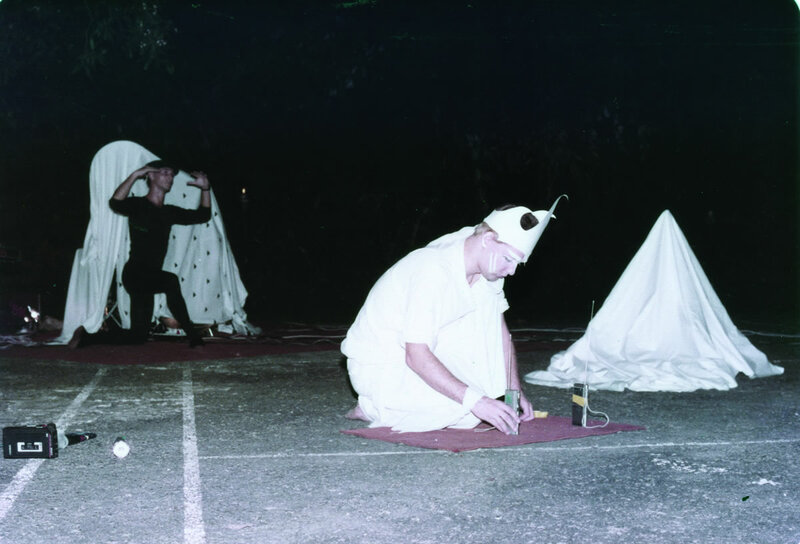 Another example is The Time Show, a 24-hour event held on the eve of 1990, organized by The Artists Village at their studio in Ulu Sembawang. It saw a broad spectrum of practitioners come together including, for example, a joint performance by Khairul Anwar and the Late Comers, This Time 12 O’Clock Comes Later than Scheduled, a collaboration between theatre practitioners, musicians, sculptors, painters and performance artists (Fig. 2). 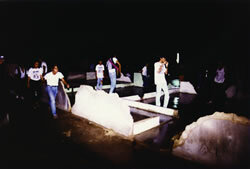 The Artists’ General Assembly, a week-long arts festival that took place over 1993–94 organized by 5th Passage Artists Ltd. and The Artists Village, also witnessed various exchanges between alternative art and music practitioners, working in collaboration or in mutual support of one another’s experimentation. The archive also features glimpses into artist Nguang How Koh’s solo exhibition Monuments for Trees at The Substation’s garden in 1990, during which he collaborated with experimental music duo Corporate Toil (Joe Ng and Fook Yew Wong) for their performance Certain Earth Screams. Also documented in the archive is Body Fields, a New Year’s Eve event in 1992 organized by 5th Passage Artists Ltd. during which Convent Garden’s musician Jason Tan participated and created sounds using his body and found objects in his collaboration with XYLVA’s Daniel Joseph (Koh 2013). These are but a few of the many events that took place in Singapore during the 1980s and 1990s. While it can be argued that the use of sound in performances during that period was not driven by an interest in sound alone, as Lee Wen and Zai Kuning pointed out, these sounds were not a superfluous additive to performance, rather they activated an active perception that brought situations and relationships into play through the immediacy of sound within a performative matrix. This mirrors a Cagean sensibility in which music expands to become increasingly open-ended as a means rather than an end. Many sonic stirrings in Singapore have also gone undocumented or are overlooked and forgotten. The body of work of artist Gilles Massot, who moved from Marseille and has been based in Singapore since 1981, is one example. Massot conceived of and organized the Art Commandos, who during the Festival Fringe of 1988, performed and created installations across various public spaces, encouraging a spirit of artistic experimentations that included working with sound through improvisations with DIY music instruments and sound-makers. Another example worth mentioning is one of the earliest sound and light performances in Singapore, Good Evening, My Name is Michael Peuh 18 18.7, created by Massot in collaboration with musician and sound artist Philippe Radoux in 1985 (Fig. 3). The performance, created within the context of multi-media art collective Talking Eyes, took place at the wedding of the hosts of Magic Night Ronni and Uta Pinsler who commissioned the performance. The performance was a progressive build-up of light and sound, generated using unorthodox instruments such as tape recorders, a TV set, two-way radio transceivers, cymbals and reading text whilst lying on the ground (Massot 2013). These events are largely overlooked for various reasons, not only because little was written about sonic experimentation. Massot pointed out that his practice then (and now) was broadly multidisciplinary and that this resulted in him falling outside the radar of people writing about the visual arts in Singapore (Ibid.). Furthermore, consideration of national identity was a key concern at the time and Massot, who had only arrived in 1981, did not fit in comfortably with the then-present viewpoint of local art practices, however transnational it may have been in its origins and development. Worthwhile sonic stirrings such as this that can further understandings of the development of sonic arts in Singapore have often not been written about, and many have taken place in underground or at alternative venues, with little documentation to speak of. Many of such events, including those I’ve mentioned above, were related to us in conversation, based on personal experiences and memory. It is for this reason that Finding Sound also ventures to explore oral tradition as a gateway to preserving memory and “passing down” local knowledge of Singapore’s sonic culture history. This is explored through a series of interviews with artists, archivists, musicians, academics and observers of the sonic field. It attempts to piece together various positions and personal investments in sonic arts that overlap and contradict, offering audiences a glimpse into a complex history from different viewpoints. Far from being borne out of systematic research, it is, rather, a space to reflect on various fragments of local events and developments in the sonic arts from the 1980s onwards, revisited through the individual experiences of its participants and observers. It abounds in personal stories, forgotten stances, suppositions, names, and memories. This search for the intersections between sound and the visual arts’ intersecting trajectories is an attempt to understand the beginnings of sonic arts in Singapore — one that is unravelled to be questioned, probed and diagnosed. SOUND is the realization of an exhibition we wanted to see and hear in Singapore. Despite the many intersections of sound’s and visual art’s trajectories, even if brief, there has not yet been an exhibition in Singapore dedicated to the scope of divergent developments in sound in the arts, so to speak. 1[1. In this respect, the alternative contemporary arts space The Substation has been crucial to the development of sonic arts in Singapore. It has for many years been the fertile middle ground between visual artists, musicians and performers, and has continually supported sound art and experimental music activities.] Today, there remains a divide between sound and the visual arts, with sound works often taking the back seat when it comes to thinking about art and mounting exhibitions. 2[2. This is due to several reasons including, as artists have pointed out, the lack of sound curators and suitable infrastructure in galleries, lack of critical discourse or writing about sound, and the sustainability of sonic practice, to name a few.] This exhibition, in its first edition, seeks to explore the sonic languages of various practitioners in Singapore, and to offer an invitation to listen to a range of sonic expressions. Consider this a first attempt. Heggarty, Paul. Noise / Music: A History. New York: Continuum, 2007. Koh, Nguang How. Private correspondence. 2013. Massot, Gilles. Email exchange. December to February 2013. Nancy, Jean-Luc. Listening. New York: Fordham University Press, 2007. Voegelin, Salomé. Listening to Noise and Silence: Towards a Philosophy of Sound Art. London: Continuum, 2010. Wen, Lee and Zai Kuning. Private correspondence. 2013. Wong, Mark. Email exchange. 10 September 2013. Joleen Loh is a curator and writer. She was the associate curator at the Institute of Contemporary Arts Singapore under the directorship of Charles Merewether. 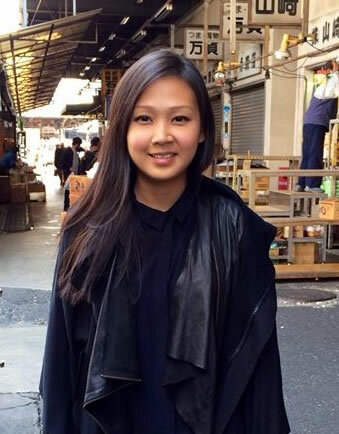 She is currently the 2014 Busan Biennale Special Project curator and is also currently editing a survey publication of 60 contemporary artists in Singapore. Previously, she was the curatorial assistant at the Singapore Art Museum for “Lee Wen: Lucid Dreams in the Reverie of the Real” and was the visual arts curator of the 2013 Lit Up Festival. Her curatorial work includes “SOUND: Latitudes and Attitudes” at the ICA Singapore, Flux at Strarta, Saatchi Gallery (UK), INTERPLAY at Art Stage Singapore 2013, and “From Wonder to Ruins” at Fehily Contemporary (AUS). Her texts have been published in TODAY News, Glossary, Media Lab Projects, Asian Arts Space Network, Art Stage Singapore, Praxis Press, UN Magazine and Daily Serving.